I have no problems admitting that I am an “Information” junkie. Hey, it’s the reason I’m so smart (wink). For as long as I can remember I’ve loved books… reading them… holding them… flipping the pages. When I could barely talk and before I could “really” read, I’d memorize the books my mom read to me and “read” them back to her. Hey, I was good! At first she couldn’t even tell I wasn’t really reading. I was turning pages at the right point and everything. Guess I was just destined to be a connoisseur of good books. That being said, I figured what better to share than the life-changing wisdom that can be found in a really good book. I’ve shared a reading list before, but this is one that had a HUGE and MEGA-profound impact on my life. I’m sharing it because I believe books can change our lives if we apply what we learn in them… or, at the very least, cause a shift in our life’s philosophy or perspective. 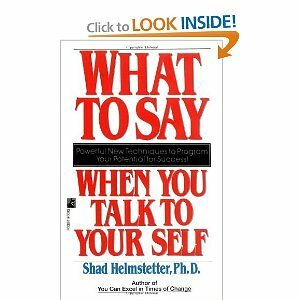 WHY I LOVE IT: For me, this book shed a HUGE spotlight on the one thing that causes us to sabotage ourselves. As much as we’d like to think and are conditioned to think it’s the “outside” forces keeping us stuck, in reality it’s our own limited thinking. Which is a result of what we believe. And unfortunately, our belief system begins getting shaped when we are children. What Shad shares in this book renews hope that all is not lost. We are not destined to only get by. We CAN change our lives if we make the commitment to change what we believe and how we think. And we do that by changing what we say when we talk to ourselves. Ponder this: the success you achieve is directly tied to how limited you are in what YOU believe. If you believe you’re a victim of life’s circumstances, then you’ll BEHAVE like a victim. And if you believe you are a thriver (not just a survivor) and an overcomer, no matter what the obstacle, then you’ll BEHAVE that way. AND… big AND… the canvas of your life will be painted with the RESULTS of your behavior… which is a result of what you believe… which is a result of what you SAY to yourself. Whew! That’s major! I can’t say enough how much I love, love, love this book. I do. And I didn’t just read it. I applied what I read. And I still apply it everyday. I constantly work on upgrading my belief. I talk to myself… out loud… yep, I do. I tell myself how great I really am… yep, I am ;). I recorded myself saying great things about myself and I listen to me talking about me everyday. Yep… I do. And, in my humble opinion, you should too! What can I say, it works. Try it for yourself and see. *sidenote: I am an Amazon affiliate so any links in this site that go to Amazon are affiliate links.